Click the image for an enlarged view and to read the text of the World Food Programme map. Animal agriculture continues to be under-represented in discussions and policies geared at curtailing climate change, and the world’s hungriest people will suffer more as a result. Climate change is a hunger risk multiplier, with 20 percent more people projected to be at risk of hunger by 2050 due to extreme weather events. Unfortunately, the world’s most food insecure populations are also those disproportionately harmed by climate-related events, including increased heat waves, droughts, hurricanes, tsunamis, and flooding. There are a variety of reasons for this increased vulnerability, including the basic geographical distribution of climate change impacts. In many countries, people of lesser means are increasingly concentrated in coastal towns, flood zones, and dry rural areas where climate change is poised to take a greater toll. “As the coastal cities of Africa and Asia expand, many of their poorest residents are being pushed to the edges of livable land and into the most dangerous zones for climate change. Their informal settlements cling to riverbanks and cluster in low-lying areas with poor drainage, few public services, and no protection from storm surges, sea-level rise, and flooding. Of all anthropogenic (human-caused) sources of greenhouse gases, one of the greatest contributors is animal agriculture. Although the reported percentages vary based on what factors are counted, even the U.N. Food and Agriculture Organization’s (FAO) conservative calculations hold animal farming responsible for 14.5% – 18% of anthropogenic greenhouse gases— that’s more than all transportation combined. Climate scientists Robert Goodland and Jeff Anhang published a World Watch Magazine report detailing crucial data missing from the FAO’s 18% figure. Their re-analysis, factoring in the missing variables as well as adjusting for misallocations and undercounting, puts animal agriculture’s contribution to anthropogenic greenhouse gases at a staggering 51%. It’s noteworthy that even at the conservative end of the spectrum, the percentage for animal agriculture eclipses most other human-caused greenhouse gas emissions. Climate authorities project that if greenhouse gases are not reduced significantly worldwide by 2017, or at the latest by 2020, then climate change is likely thereafter to become irreversible. To this end, A Well-Fed World encourages a greater focus on plant-based food choices at the individual level, and plant-based feeding and farming approaches to hunger and food security at the policy level. We also urge a strengthening of recommendations like those of the United Nations Environment Programme (UNEP) for a global shift away from meat and dairy to combat the harmful impacts of animal agriculture on climate and world hunger. They note that “a substantial reduction of impacts would only be possible with a substantial worldwide diet change, away from animal products” (p.82). Below is an overview of the ways in which climate change reduces food security and increases hunger. 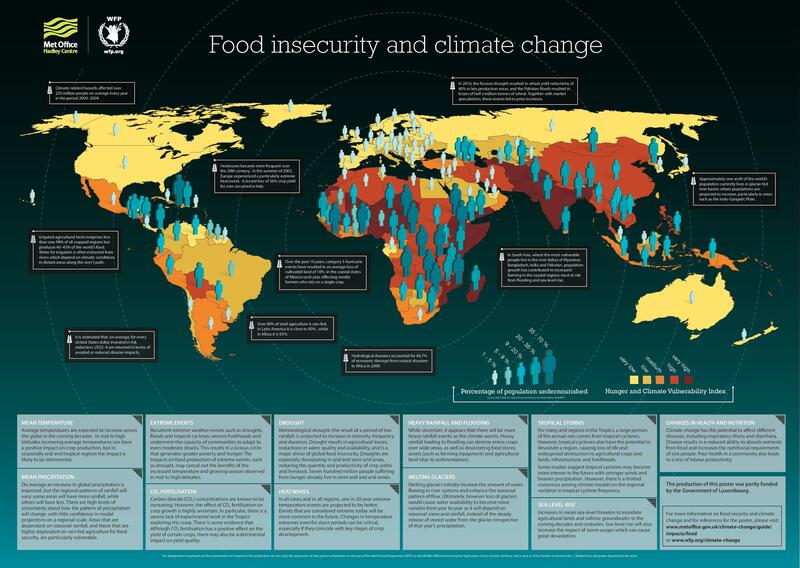 You can also enlarge the interactive map (above) and click on black text boxes for details about how climate change is already adversely affecting food security around the world. Climate change will affect all four dimensions of food security: food availability, food accessibility, food utilization and food systems stability. It will have an impact on human health, livelihood assets, food production and distribution channels, as well as changing purchasing power and market flows. Its impacts will be both short term, resulting from more frequent and more intense extreme weather events, and long term, caused by changing temperatures and precipitation patterns. Evidence indicates that more frequent and more intense extreme weather events (droughts, heat and cold waves, heavy storms, floods), rising sea levels and increasing irregularities in seasonal rainfall patterns (including flooding) are already having immediate impacts on not only food production, but also food distribution infrastructure, incidence of food emergencies, livelihood assets and human health in both rural and urban areas. In addition, less immediate impacts are expected to result from gradual changes in mean temperatures and rainfall. These will affect the suitability of land for different types of crops and pasture; the health and productivity of forests; the distribution, productivity and community composition of marine resources; the incidence and vectors of different types of pests and diseases; the biodiversity and ecosystem functioning of natural habitats; and the availability of good-quality water for crop, livestock and inland fish production. Arable land is likely to be lost owing to increased aridity (and associated salinity), groundwater depletion and sea-level rise. Food systems will be affected by internal and international migration, resource-based conflicts and civil unrest triggered by climate change. Average temperatures are expected to increase across the globe in the coming decades. In mid to high latitudes, increasing temperatures can have a positive impact on crop production, but in seasonally arid and tropical regions, the impact is likely to be detrimental. On average, an increase in global precipitation is expected, but the regional patterns of rainfall will vary: some areas will have more rainfall, while others will have less. There are high levels of uncertainty about how the pattern of precipitation will change, with little confidence in model projections on a regional scale. Areas that are dependent on seasonal rainfall, and those that are highly dependent on rain-fed agriculture for food security, are particularly vulnerable. Recurrent extreme weather events such as droughts, floods and tropical cyclones worsen livelihoods and undermine the capacity of communities to adapt to even moderate shocks. This results in a vicious circle that generates greater poverty and hunger. The impacts on food production of extreme events, such as drought, may cancel out the benefits of the increased temperature and growing season observed in mid to high latitudes. Carbon dioxide (CO2) concentrations are known to be increasing. However, the effect of CO2 fertilization on crop growth is highly uncertain. In particular, there is a severe lack of experimental work in the Tropics exploring this issue. There is some evidence that although CO2 fertilization has a positive effect on the yield of certain crops, there may also be a detrimental impact on yield quality. Meteorological drought (the result of a period of low rainfall) is projected to increase in intensity, frequency and duration. Drought results in agricultural losses, reductions in water quality and availability, and is a major driver of global food insecurity. Droughts are especially devastating in arid and semi-arid areas, reducing the quantity and productivity of crop yields and livestock. Seven hundred million people suffering from hunger already live in semi-arid and arid zones. In all cases and in all regions, one in 20-year extreme temperature events are projected to be hotter. Events that are considered extreme today will be more common in the future. Changes in temperature extremes even for short periods can be critical, especially if they coincide with key stages of crop development. While uncertain, it appears that there will be more heavy rainfall events as the climate warms. Heavy rainfall leading to flooding can destroy entire crops over wide areas, as well as devastating food stores, assets (such as farming equipment) and agricultural land (due to sedimentation). Melting glaciers initially increase the amount of water flowing in systems and enhance the seasonal pattern of flow. Ultimately, however, loss of glaciers would cause water availability to become more variable from year to year as it will depend on seasonal snow and rainfall, instead of the steady release of stored water from the glacier irrespective of that year’s precipitation. For many arid regions in the Tropics, a large portion of the annual rain comes from tropical cyclones. However, tropical cyclones also have the potential to devastate a region, causing loss of life and widespread destruction to agricultural crops and lands, infrastructure, and livelihoods. Some studies suggest tropical cyclones may become more intense in the future with stronger winds and heavier precipitation. However, there is a limited consensus among climate models on the regional variation in tropical cyclone frequency. Increases in mean sea-level threaten to inundate agricultural lands and salinise groundwater in the coming decades and centuries. Sea-level rise will also increase the impact of storm surges which can cause great devastation. Climate change has the potential to affect different diseases, including respiratory illness and diarrhea. Disease results in a reduced ability to absorb nutrients from food and increases the nutritional requirements of sick people. Poor health in a community also leads to a loss of labour productivity. For an in-depth look at the ways animal agriculture directly contributes to climate change, click here. Learn more about why we promote plant-based approaches to global hunger, as well as specific plant-based feeding and farming programs we sponsor, here.